Brilliant educator, loving the environment, the honoured professor Vasile Ciurea – founder of the first museum of Fălticeni in 1914 – knew how to pass over to his students some of his passio and respect for nature as well as the pleasure of collecting rare samples for the purpose of study and observation. Mihai Băcescu is one of Vasile Ciurea’s disciples who has never forgotten either his first initiator in the secrets of the nature, or his birth country. And so – on the 17th of August 1982 – the Museum of Natural Sciences of Falticeni was founded as a „mask of love and gratitude” towards professor Vasile Ciurea. „Vasile Ciurea taught me to love flowers and all animals, we were preparing together the fish samples for the old museum. Suceava county was rich in study material proficient to my growing passion. The museum is a highlight of my activity, especially in the field of ocean study: there are hundreds of animals which I brought from three oceans, many of them unique not only in Romania, but also compared to the most famous Museums of the planet. I wanted thus to rebuild and enrich the old collection of aquatic species of the time reminding me of professor Ciurea. It has been set up as an aquatic museum – unique in the world. So as to avoid delays of the joy of offering a special objective to people, I called it a museum of natural sciences. But by structure and items exhibited, I must make it clear at his point, this is an aquatic museum”. Indeed, from March 28th 1993, the museum was renamed the Aquatic Museum and it will also get the name of its founder: Mihai Bacescu. This was the expectations of recognition through a gesture of gratitude and praise of the one who dedicated his life to the research of the marine environment were accomplished and he enriched his native town with a universal and everstanding cultural mark. By structure and scientific data consistency, “Mihai Bacescu” Aquatic Museum is a brilliant opportunity for learning, a voyage into the world of seas, an insight into the misteries of Romanian and international studies. The Museum consists of organically structured compartments – of real scientific interest. In the good tradition of the town’s museums there are two halls to remind us the features of the first town museum where few items render the nature of passion and interests of the pioneers, especially of the first founder, Vasile Ciurea. We find represented here most of the sections within the old museum: archeology, history, old weaponly, ethnography, old books, monetary collections and photographies. “The Coach”- a very valuable item – sculpted by Leon Comnino over 35 years with 35 years with a small knife and exhibited in 1937 at the Universal Exhibition from Paris impresses and holds the visitors’ attention for long, due to its masterly execution – a hint of the artist’s craft of details. The visit of the main body of the museum start just after, with a marine history and the traditional fishing tools hall. “Leasa, varsa, sacul de fund, etera, crasnicul, volocul, ostia ans prostovolul are reminders of the prohibited tools specificly belonging to field, hilly or mountaineous areas, besides which there is an old boat crafted out of red willow wood over three hundred years old, the monoxyle, used by fishermen on the Danube canals at Braila. 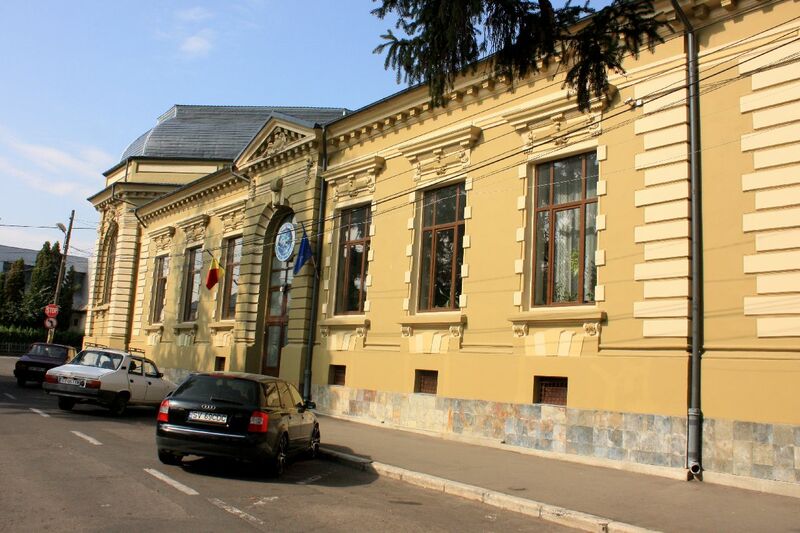 Further on, we enter the world of research done by Emil Racovita, Grigore Antipa, Paul Bujor and Ion Borcea, the items here highlighting the contribution of Romanian sciences to the field of hydrobiology. Member of numerous ocean expeditions, discoverer of numerous species of fish and shellfish, the academician Mihai Bacescu presented the museum whith over 700 items, among which few can be considered exceptionally rare: sea – sponge, colals, sea hedgehogs, sturgeons, venoneous snakes, turtles, crocodiles, etc, besides which lies a significant number of works belonging to diverse fields: botanic folklore, zoology, terrestrial and marine ecology, museology. All these are exhibited within two halls, as a homage paid to Mihai Bacescu as a scientistm to his research work and to his authorship of 475 scientific works published alone or in co-operation whith other foreign or Romanian scientists. The great pleasure of the visitors, especially of the young ones, is the part dedicated to living species: the aquariums. In the 13 basins of over 11.000 litres of water are kept alive many indigenous and exotic species of fish, turtles, shells, and crayfish – an enchanting display of diverse colours and shapes. The compartment of environmental set-ups, representing nine ecosystems, takes us from the Moldova River to the Atlantic Ocean. These set-ups, entitled: „Moldova River”, “Fălticeni Pond in Summer”, “Fălticeni Pond in Winter”, “The Bicaz Barrage”, “Danube Delta”, “The Negative Outcome of Pollution”, “The Black Sea Seal”, and “The Atlantic Ocean” introduce us to the characteristic flora and fauna of specific areas. The Museum’s heritage is enriched with a geographical globe model, unique in the worl by the fact of showing a scale representation of the marine landscape beside the terrestrial landscape. Donated in 1983, the model was skillfully executed in minute detail by Mr. Isaic Neculai of Vadu Moldovei, Geography teacher, over a period of five years and a half. The Aquatic Museum “Mihai Bacescu”- Falticeni boasts its own strong scientific distinction in the world, a place of heightened cultural awareness open to all visitors from Romania and abroad in love with science; a true promoter of love and care for the most important resource of planet Earth: WATER. “The whole museum”- said Mihai Bacescu in the same year, 1982 – ‘’is awarning to preserve Nature, its most precious gift, the water. Life cannot be conceived, without water. I live in faith that people’s will shall respond to this warning. Keep waters clear! Love Them!”. It has been rightly said that the mountain meets the sea in our museum. But to understand the truth of this sintagm you need to visit it, to see, to hear and to forget not.